Stock status is current as of 4/24/2019 11:55 PMET. Get a neat and organized way of connecting your cables using the Tripp Lite - Patch panel - 48 ports. It is designed with 48 ports which are numbered both on the front and the back, which lets you monitor the cable runs. You also have the convenient option of integrating your RJ-45 female connectors with 110 type termination. 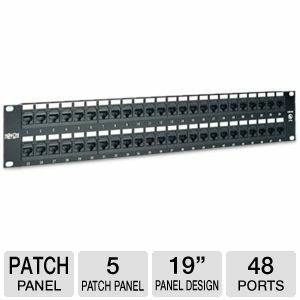 This patch panel falls in line with the EIA/TIA-568 Category 5e standards and is extremely comfortable with not requiring too big a place with its 19" panel size. Pick the Tripp Lite - Patch panel - 48 ports today!